During the past eight years I’ve spent working in this industry, I have managed buildings with various levels of tenant engagement. While some buildings may not have an active tenant population, other buildings are sky high with tenants who will rush down to the lobby for ice cream socials or who make a mental note to remember the date of a building-wide event. Appraising your building’s level of engagement is important as a property manager because it puts you in touch with the needs and interests of those you serve. If your tenants want to be left alone, giving them their space may be the best way to keep them happy. But for the tenants who are yearning for some activity, you have the added benefit as a PM to host events that tenants will eagerly mark on their calendars. And you can even organize events that simultaneously meet both tenant needs and community needs. I was lucky enough to do just this several weeks ago at my building, 120 South LaSalle Street. 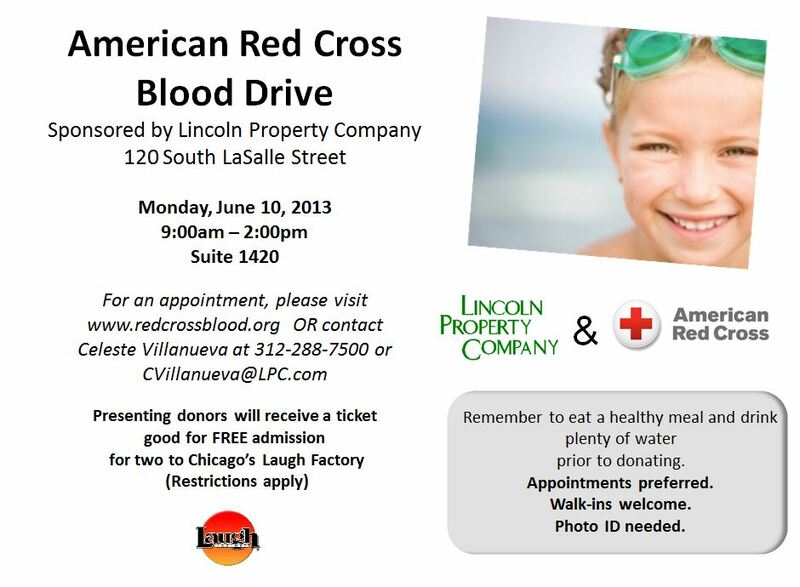 On June 10, with the help of the Red Cross and numerous tenants, Lincoln Property Company sponsored a building-wide blood drive that resulted in donating enough blood to save 111 lives! This was the third, and the most successful, blood drive I have organized during my career. Our goal was to donate 30 pints of blood (a pint of blood save three lives), but we ended the day by handing over 37 pints of our blood to the Red Cross. We decided to hold a blood drive because our anchor tenant, The PrivateBank, wanted to give back to the community. The PrivateBank originally planned to keep the drive in-house, but then concerns arose of whether or not enough people would volunteer to make the drive possible. Staff members at The PrivateBank then approached me to ask if Lincoln Property Company could donate conference room space to host a drive that would be open to the entire building. We fully backed this initiative and happily scheduled a time for the conference room. After the date and time was confirmed, we began to finalize the blood drive details with the Red Cross. to spread the word about our blood drive. We then hit the ground running promoting the event and encouraging people to volunteer. My job was to put up a Captivate Screen announcing the drive and to send out a promo email to all building tenants. The PrivateBank created excitement around the drive by recruiting “Celebrity Donors,” including the CEO and several VPs. With the “top dogs” donating their blood, people felt a communal urge to volunteer, too. The Boston Marathon bombing occurred during the time we were enlisting volunteers. We referenced this tragedy to drive home the point that donating blood truly saves lives. By tying our blood drive to a specific event, we felt we were able to motivate people to make a difference. The PrivateBank also had a deeper connection to the events surrounding the Boston Marathon, as staff members had recently organized a company Running Club comprised of people who run about 5 – 8 races a year. The Running Club sent out weekly emails to recruit donors, hung flyers in break rooms and kitchens and posted volunteer details on the PrivateBank’s Intranet site. By the time June came around, we had over 30 volunteers signed up. When the drive was over, we exceeded our goal by 7 pints and even took blood from some last-minute volunteers. A total of 43 people donated their blood on June 10 and all of those who made the event possible went home that night knowing our collective effort paid off. When I began to reflect upon the legwork it took to host the drive, I realized that there were five key factors that led to our success. I would like to share these factors with you because I understand that hosting a blood drive may seem overwhelming when there is no guarantee that your building tenants will show up or that the blood pint requirements established for your building will be met. These tips are meant to help you determine if a blood drive is realistic for your building and if so, how to make your drive memorable and successful. 1) Be aware of your own building’s level of tenant engagement. If your tenants are not an active group, a blood drive may not be for you. But if you have energetic tenants who are eager to get involved, hosting a blood drive may be worth the time. 2) Work closely with an anchor tenant in planning and promoting the blood drive. You and your anchor tenant can spread excitement for the blood drive throughout the building. You can also have a unique feature about your drive, like the Celebrity Donors the PrivateBank recruited, which will incite a strong word-of-mouth campaign. 3) Communicate, communicate, communicate with your tenants. It’s not enough to just tell the main contact of your tenants about the drive, as they might not relay the information to their staff. If your building has a way to get the message out to all the employees, like a Captivate screen, that is a resource you should use. Furthermore, the blood bank representative may have some user-friendly marketing materials that you can easily customize. 4) Utilize your lobby staff, such as security guards, to help spread the word. My building is lucky to have a very outgoing security guard who welcomes each guest with a smile and a greeting. He was pivotal in informing tenants about the blood drive and encouraging people to sign up. 5) It takes a team to save lives. Not only did our security guard and the rest of the building staff help spread the word, they also donated blood! Saving lives is a communal effort, and this building rallied together to exceed the goal we set forth. As an added bonus, working together to host this blood drive was well worth the effort – it strengthened the building management team and our relationships with the tenants! Please contact me if you have any questions about hosting a blood drive. I am happy to share best practices for a successful outcome. You can email me at CVillanueva@LPC.com. Lastly, I would like to stress that blood banks are always in need of donors. Blood has a limited shelf life and needs to be replenished on a regular basis year-round. You never know whose life you’ll impact or save by taking the time to donate blood. I encourage you to organize a drive by the end of the year so that you and your tenants can make a difference. This entry was posted in Chicago CRE Industry, Chicago CRE industry and philanthropy, Chicago Philanthropy, Property Management, Tenant Relations, Uncategorized and tagged 120 South LaSalle, blood banks, blood donors, blood drive, BOMA/Chicago, Boston Marathon, host a blood drive, Lincoln Property Company, Red Cross, tenant engagement, The PrivateBank. Bookmark the permalink.